PARALUTION is a library that enables you to perform various sparse iterative solvers and preconditioners on multi/many-core CPU and GPU devices. Based on C++, it provides a generic and flexible design that allows seamless integration with other scientific software packages. PARALUTION contains Krylov subspace solvers (CR, CG, BiCGStab, GMRES, IDR), Multigrid (GMG, AMG), Deflated PCG, Fixed-point iteration schemes, Mixed-precision schemes and fine-grained parallel preconditioners based on splitting, ILU factorization with levels, multi-elimination ILU factorization, additive Schwarz and approximate inverse. The library also provides iterative eigenvalue solvers. The library can be compiled under Linux/Unix-like , Windows and Mac OS. 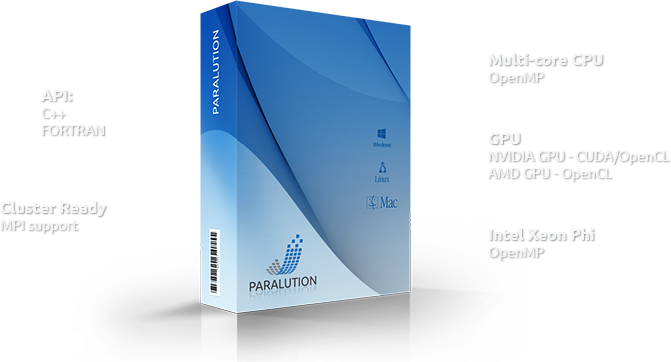 PARALUTION provides multi-core CPU/Host (OpenMP), NVIDIA GPU (CUDA, OpenCL), AMD GPU (OpenCL), Intel Xeon Phi/MIC (OpenCL, OpenMP/offload mode) support, including VS (Visual Studio) gcc (GNU C++) and icc (Intel C++) compilers. 10 Reasons to Try PARALUTION!